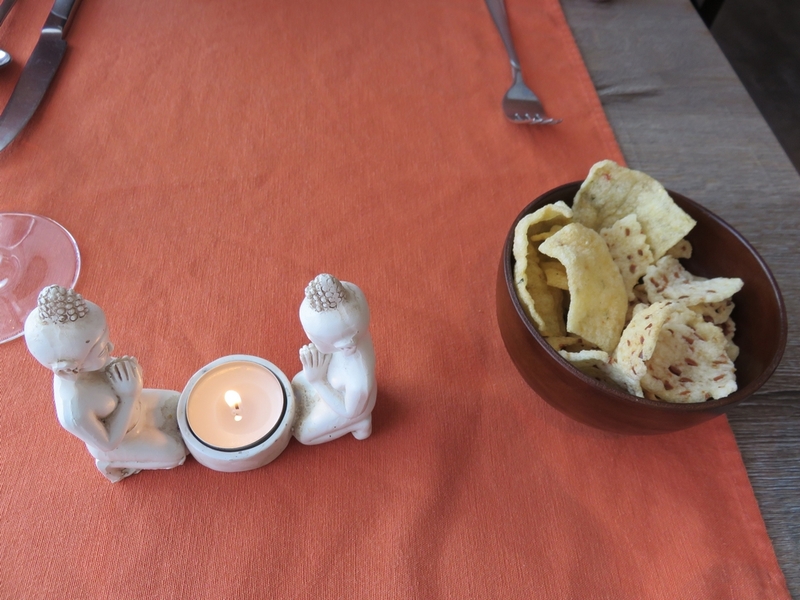 Restaurant review #45 – A couple of weeks ago, we went to Indonesian restaurant Lemon Grass in Tielt. Tielt is a small provincial town in Western Flanders, about 35 km from Bruges. We love Indonesian food, and there are plenty of Indonesian restaurants in the Netherlands. Mostly it’s no problem to get a full vegan ricetable. So whenever we are in the Netherlands, we try to visit one. 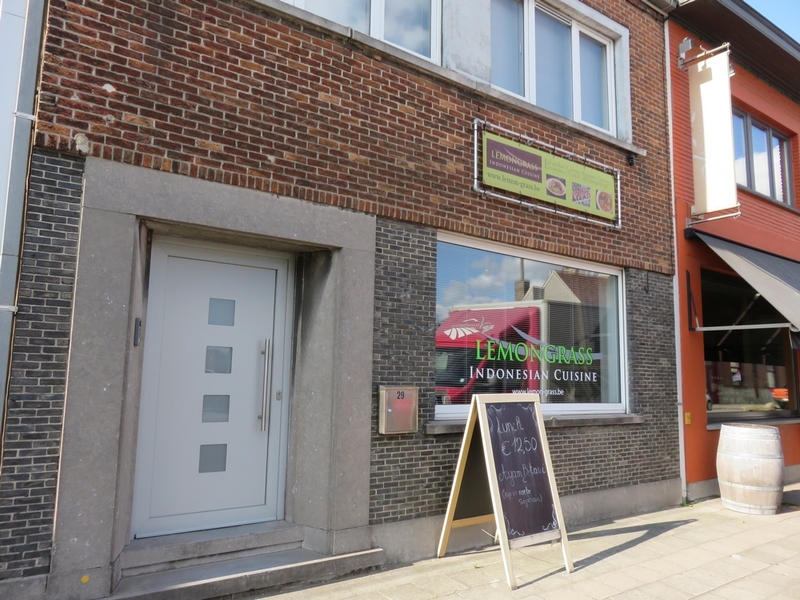 Unfortunately there are not that many Indonesian restaurants in Belgium, so we were pretty happy to see Lemon Grass open in Tielt recently! Looking at the menu, I saw a couple of dishes that I guessed were vegan. I called in advance to check, and indeed there are vegan options on the menu, so we made a reservation. Upon arriving, it seemed not really necessary to make a reservation (it was a midweek evening, we were alone at first, then another couple came in). It was quiet and relaxed. 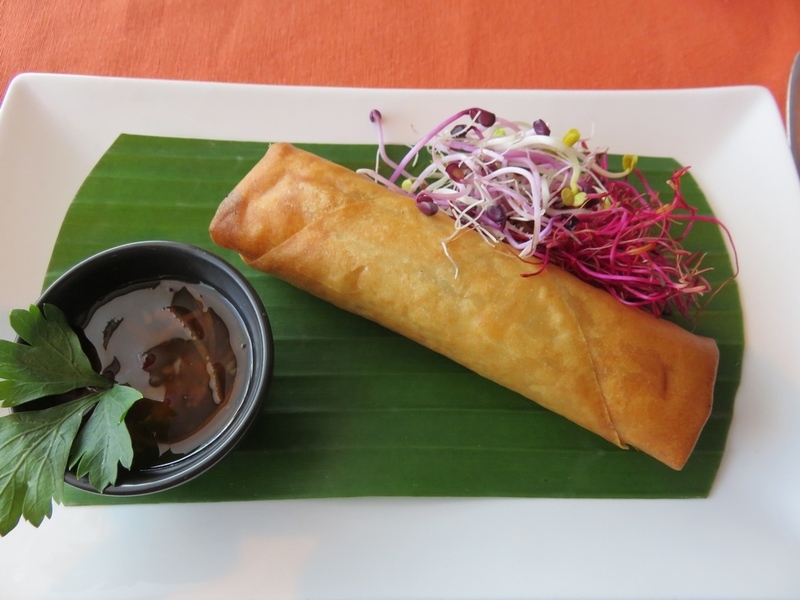 Springrolls with vegetables as a starter (6€). This is the only vegan starter on the menu. 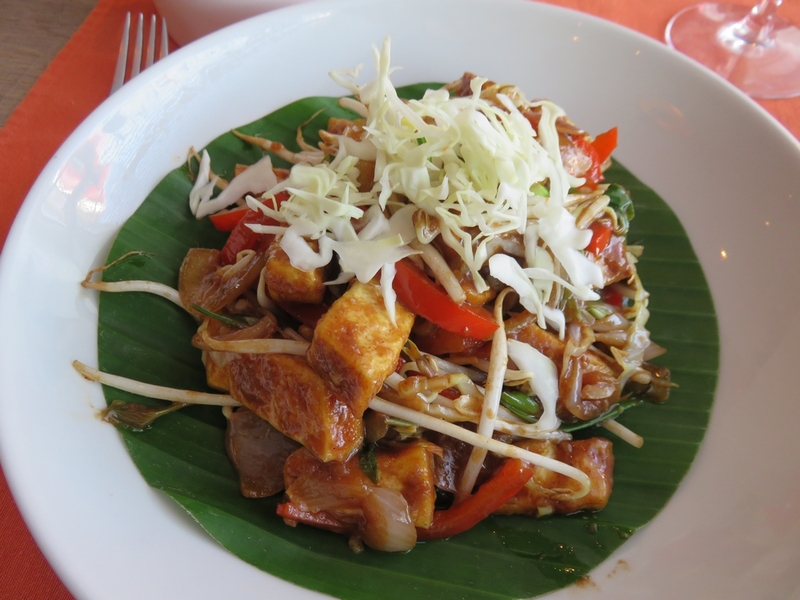 As main courses, baked tempeh in Balinese sauce (12,6€) and wokked soy beansprouts with pepper, tofu and black bean sauce (12,60€). Both served with plain white rice. I totally didn’t fancy the tempeh dish. The tempeh tasted very ‘water-like’ and the dish also consisted mainly of tempeh (I think there was a whole roll in there) with hardly anything else. I could only eat a couple of bites of the dish and then had enough. The tofu dish was better, but also rather blend, with the tofu pieces seemingly not marinated or pre-baked (as if they came straight from a package). It was reassuring that the waiter had a good idea of what vegan meant, and was knowledgeable about animal ingredients, baking in animal fat, etc. 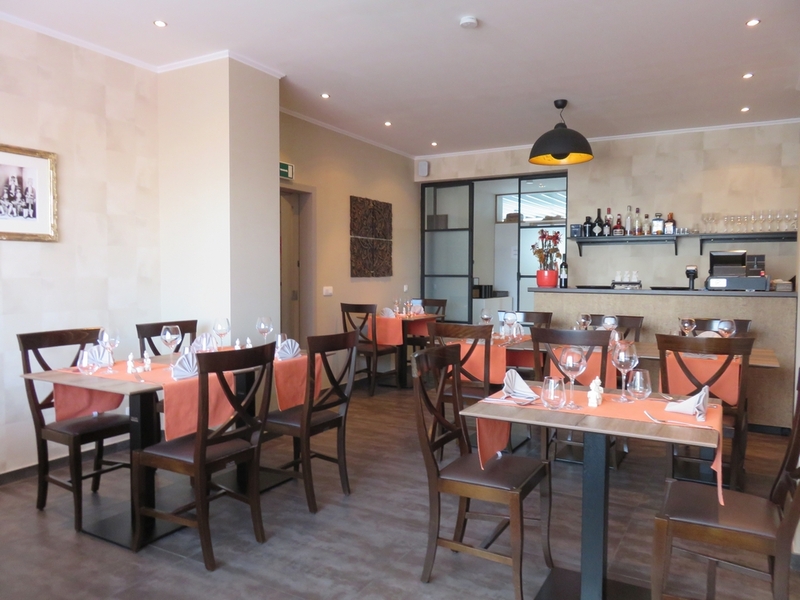 It’s a clean and brand new place, and the atmosphere was relaxed. A bit disappointed they don’t serve a ricetable (like for example here), as that is what we normally order in Indonesian restaurants. It’s also remarkable there’s nothing in peanut sauce on the menu (one chicken dish, but no vegan dish with peanut sauce). 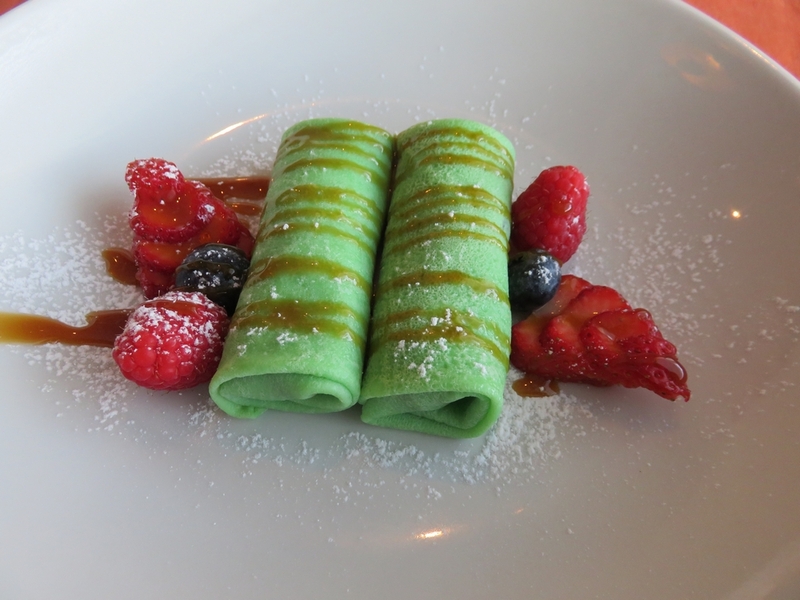 I definitely would not be ordering the tempeh balinese again, but there are some other vegan dishes to try. We thought prices were reasonable (drink was eg 2,50€ for tonic). Pity about the tempeh. 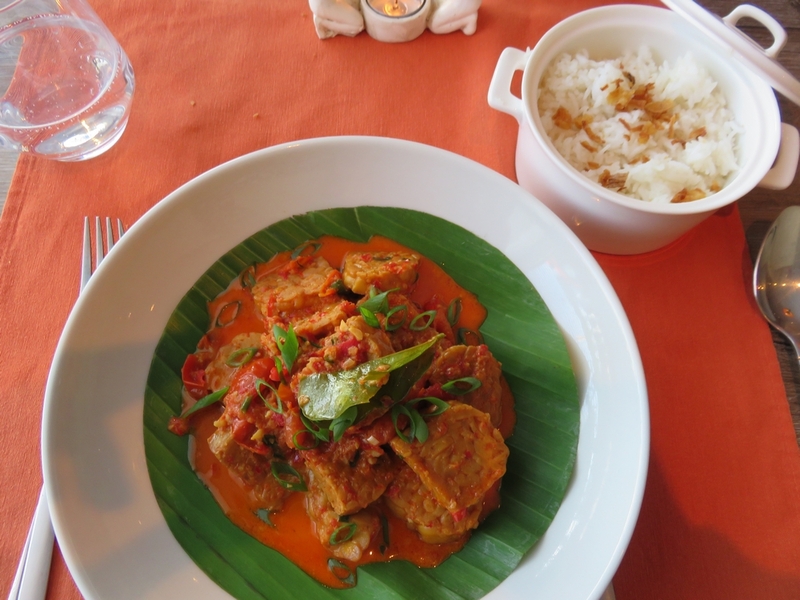 Indonesian cuisine is what got me hooked on tempeh!